View cart “ProParallax” has been added to your cart. PROMATION is a keyframe-less animation tool made exclusively for Final Cut Pro X users. 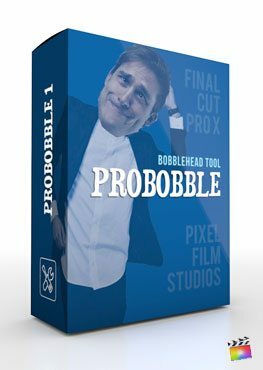 With PROMATION, easily animate pictures, videos, logos, and text without heavy editing. Simply choose the intro and outro animations desired using simple drop down menus. Choose basic animations such as scale and flip, or get advanced with dynamic bounces, hinges, and more! Utilize the green on-screen controls to set hinges for the introductory animation in Final Cut Pro X. Use the red on-screen control guides to set the hinges for the outro animation. With customizable anchor points, users can create fresh animations with complete ease. Pick and choose the animation desired using drop down meus found in the inspector window. Pixel Film Studios’ intuitive categorization allows users to easily navigate the plugins controls. Control the speed of the animation, add a spin, and adjust the anchor point to create amazing looks. Animate text and logos without having to set a single keyframe. Place a transparent logo image or basic text title in the timeline and drag a PROMATION preset atop. Find the customizable controls in the top right inspector window and choose the intro and outro animation desired. It’s that easy! PROMATION will do the rest. PROMATION allows users to create energetic bounces, hinge effects, swinging text & logos, smooth swings, and more. Control the amount of bounce, the speed of the intro/outro animations, and even add a fade. Seamlessly flip, flop, and move text, images, and videos without the headache of keyframes. Learn how to make keyframe-less animations in Final Cut Pro X with the ProMation Lesson. Let's begin by selecting a clip or image in the FCPX media library and dragging it to the timeline. For this example we will use a logo PNG. Once you have your media in the timeline, go to the FCPX titles library to locate the PROMATION presets. Browse through the animation movements and select the one that best matches the look you want. Click and drag an adjustment layer above your clip in the timeline and make it the same length. For this example, we will use the Basic preset. Now that our timeline is setup, let’s position our animation anchor points and media. Select the title layer in the timeline. The green guidelines indicate where the media will animate in from and the red guides indicate where the image will leave to. Grab the On-Screen control pucks in the Viewer window to position these guides. Next, use the center point and handle to position and rotate the media. And finally, click and drag the outer ring to scale the image. When you are finished with this step, you can uncheck the Guides checkbox in the FCPX Inspector window to hide them. Once your anchor points are in place, let’s setup the animation. In the Intro Animation section use the drop down menu to choose how you want your media to move in. You can scrub the timeline to preview each option. Once you have you have your animation type selected, Use the Speed slider to adjust how fast your media will appear. When you are finished, repeat this step with the Outro animation. Now for some Additional Information. If you would like your logo to be placed on top of footage, you will need to compound your layers first. Select everything you stacked in the timeline, then hold control and click on one of the titles. Now select New Compound Clip in the pop-up. Next, find the clip or image you wish to use as the background from the FCPX media library. When you find the clip you want… drag it onto the timeline under the compound clip. Where do I find ProMation? Once the installation is complete, you can find ProMation in the FCPX Title library.